We absolutely love tomatoes and we love to grow an abundance of them every year. We eat them fresh off the vine on a tomato sandwich and we preserve them in many different ways including salsa, spaghetti sauce, chili sauce, and homemade ketchup. While growing, tomatoes, plants must be trellised in some way to keep the plants and that delicious fruit off the ground, away from pests and fungus. Depending on how many tomatoes you plan on growing, the time you have, and the money you are willing to spend, there are many different ways that tomato trellising can be done to keep plants off the ground. The Florida Weave is an old staking and stringing technique that works well if you are growing a whole row or rows of tomatoes. This is the technique we prefer as we typically grow at least one long, 100+ ft. row. We use metal stakes on the end and throughout the row and use Cotton Butchers String or Gro-Tie Twine to do the stringing. Weave the string in a figure 8 on both sides of the plants from row end to row end, wrapping around each stake in the row. As the plants grow, simply weave another line of string higher on the stakes to support the plants. This technique is relatively inexpensive assuming everyone has some metal stakes or old fence posts laying around and all you have to purchase is the twine or string. However, this technique can be more time consuming than others as string must be added as plants grow. Tomato cages are ideal for those people who grow just a few tomato plants and have less time on their hands. This is also a good solution for people who have limited gardening space. Quality tomato cages are more expensive than a box of string, but they are also durable, re-usable, and fold up for easy storage in the off-season. 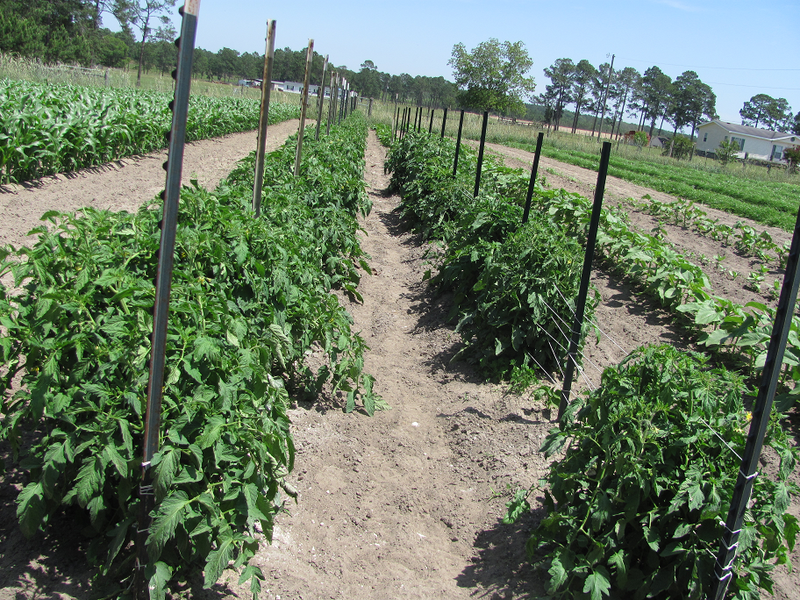 Our Tomato Cages are made of heavy, 9 gauge wire, have large 8″ square openings for harvesting, and are available in 40″ or 58″ tall versions. These cages are much more durable than the flimsy, cone-shaped supports that can be found at your local big box store. A panel trellis is a good solution for those people who have more than a few plants, but do not necessarily plant a whole row of tomatoes. 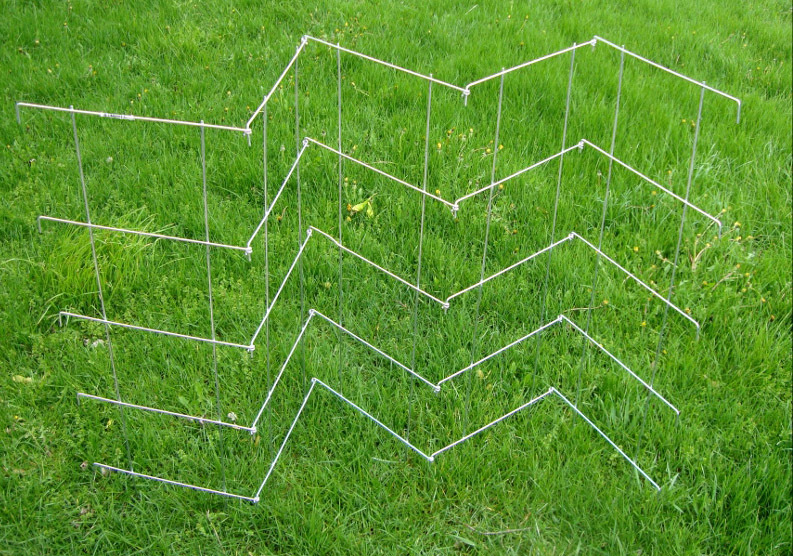 As with the tomato cages, the panel trellis technique can be more expensive than simply buying a roll of string, but it requires less time and panels are re-usable one growing season to the next. There are a variety of different panels one could use for this technique, from a galvanized livestock fence panel to a cut piece of fencing. 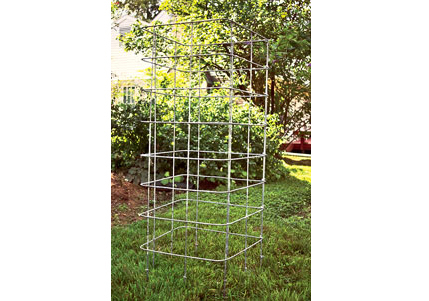 Our Pea Trellis provides a heavy duty solution as it is made of heavy, 9 gauge wire, has large openings for harvesting, and folds up nicely for compact storage in the off-season. Depending on the amount of tomatoes you plan on growing, the time you have to take care of them, and the amount of money you are willing to spend, we are confident that one of these solutions will help keep your tomatoes off the ground and your produce abundant. Here’s to a great tomato crop for everyone this spring/summer growing season!